The complete genome sequence of the KS isolate of cardamom mosaic virus (CdMV) was determined using transcriptome sequencing data from CdMV-infected Elettaria cardamomum as well as from overlapping cDNA clones made from RNA extracted from viral particles. The viral genome consists of 8249 nucleotides (nt) and encodes a large polyprotein of 2636 amino acids (aa). The polyprotein of CdMV shared 48.9%-67.4% aa sequence identity with other reported macluraviruses. Similar to the other members of genus Macluravirus, the genome of CdMV lacks the P1 coding region and the N-terminus of the HC-Pro coding region. The putative small open reading frame, PIPO, embedded within the P3 cistron, is preceded by a C(A)6 motif instead of G(A)6. 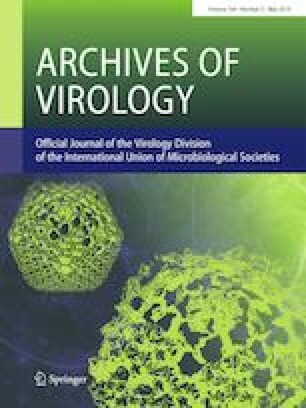 Phylogenetic analysis based on the complete genome sequence aided the grouping of CdMV along with all other macluraviruses and showed that it is closely related to alpinia oxyphylla mosaic virus (AloMV). Among CdMV isolates, the KS isolate is most similar to the Appangala isolate based on disease symptoms and phylogeny. The online version of this article ( https://doi.org/10.1007/s00705-019-04203-2) contains supplementary material, which is available to authorized users. This work was supported by the University Grants Commission (UGC), Government of India (File. No: 41-555/2012 (SR)).